R Marine Sydney hosted a picturesque voyage from Sydney to Port Stephens. Five motor yachts assembled in Sydney Harbour to cruise the 16 nautical miles north to Pittwater where three more joined the fleet. 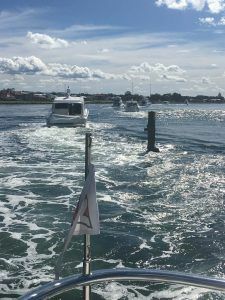 From there, it was a pleasant 36 nautical mile voyage north along the picturesque coast to the first port of call in Lake Macquarie. 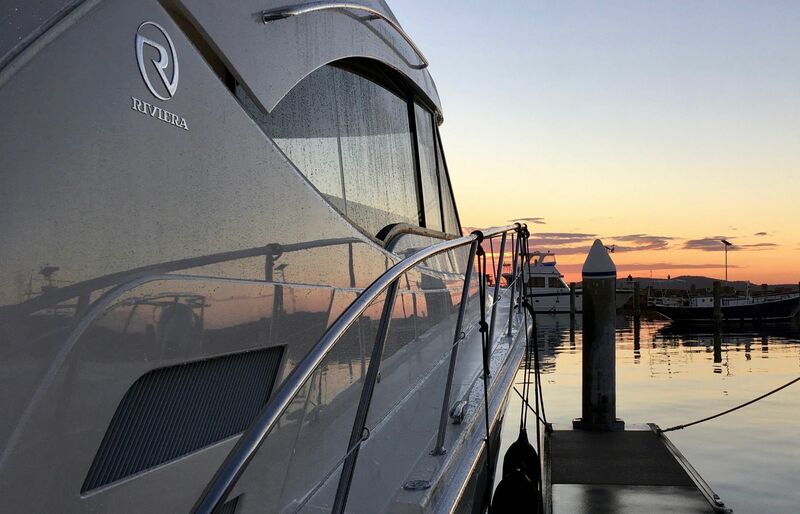 Vince and Josie Lia had never previously ventured into the open ocean aboard their Riviera 48 Flybridge. “It was a bit daunting at first,” said Vince. “I’ve run the boat between Botany Bay and Sydney Harbour, but never a longer voyage. Josie said the R Marine Sydney team made them feel completely relaxed and welcome. “We took two friends along, so the camaraderie among everyone helped us all relax on this trip,” she said. Line astern, the fleet carefully navigated the bar at the entrance to the lake and then through the Swansea opening bridge. Once safely on Lake Macquarie, they headed to the northern end of the lake to berth at Marmong Point Marina. 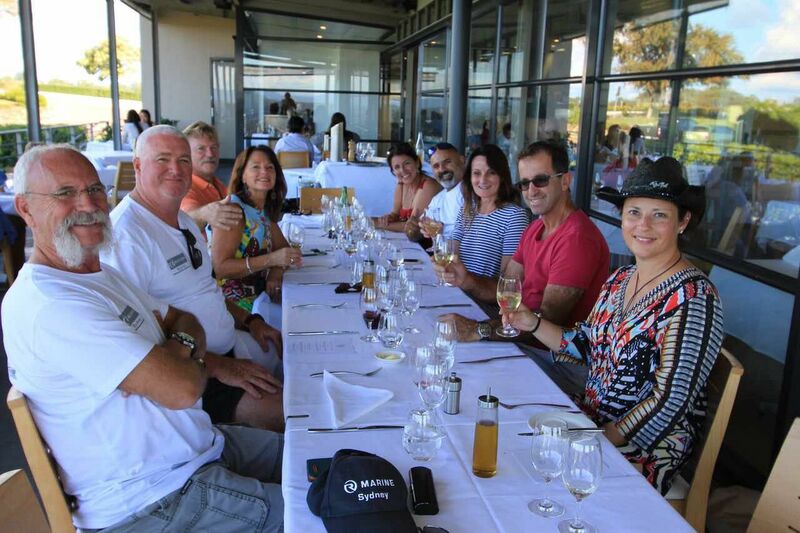 Everyone disembarked and enjoyed a three-course dinner at the local Awaba House restaurant overlooking the lake. Christine Purcell and husband Richard were aboard their Belize on the voyage. Stan and Wendy Najar also loved the restaurant. 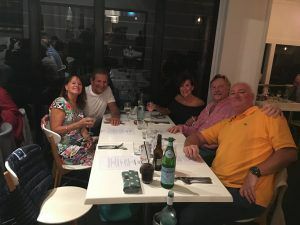 “The sumptuous dinner and excellent selection of wines capped off a wonderful day as we enjoyed the company of our fellow mariners,” said Stan. Early on Saturday morning, the R Marine team delivered newspapers to every motor yacht. After breakfast, the fleet returned offshore in beautiful sunshine and calm seas to head a further 40 nautical miles north to their destination at d’Albora Marina in Nelson Bay. Once berthed, everyone enjoyed a relaxing drink at the marina before a fleet of taxis took them the short journey to the Little Beach Boat House restaurant where they enjoyed a waterside dinner. 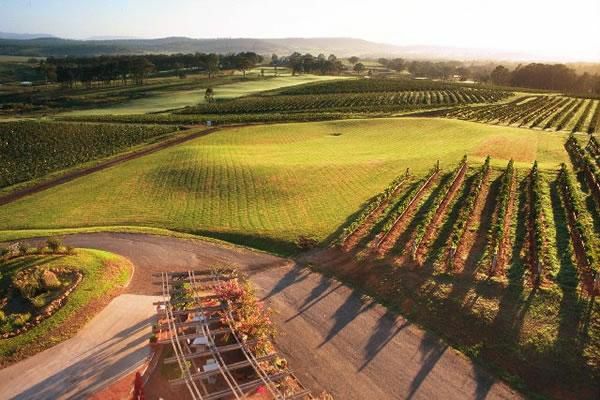 After the two sea passages, the crew took a break and ventured inland to visit the wine region of central New South Wales, the Hunter Valley. The Hunter Valley day was the highlight of the weekend for Josie Lia. Vince Lia is looking forward to the Pittwater Experience in November. “I’ve never been into the Pittwater before, and we are excited about exploring that waterway,” he said.